We have been wedding ministers for Outdoor Weddings all over Southern California. Are you planning an outdoor wedding? How about the quintessential Southern California beach wedding or the beautiful park weddings or the hotel lawn or the backyard wedding? Southern California has so many outdoor wedding venues. Since our area is so weather friendly, most of the weddings that we perform are done outside. It’s no sweat, or maybe it is depending on the month. If you’re not sure exactly where, Chris has been to every nook and cranny of Los Angeles county and Orange County and he can give you great advice on what outside wedding venues have particular features. Either California outdoor wedding location you choose, we can be there to officiate it. 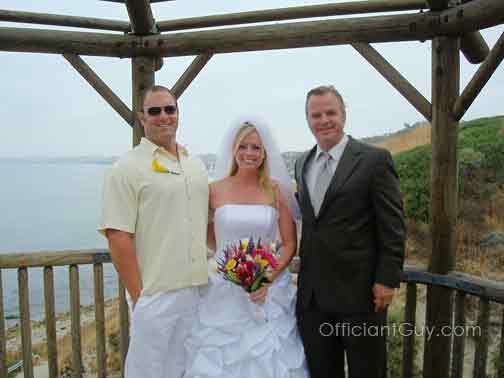 Chris Robinson is the best wedding officiant in Orange County and Los Angeles County. 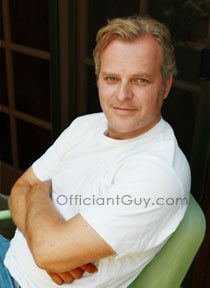 Chris Robinson, the Officiant Guy, is a Southern California officiant for weddings. He has been performing wedding ceremonies and issuing confidential wedding licenses for over two decades. 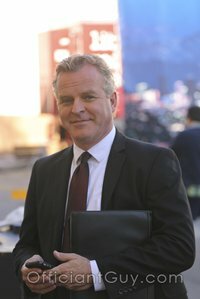 Officiant Guy could be your wedding officiant for any kind of marriage ceremony from a religious wedding ceremony to an atheist wedding ceremony with possible inclusions from handfasting ceremonies to family unity candle ceremonies. If you plan to get married somewhere in LA County give the top marriage officiant in Southern California a ring at (310) 882-5039 or (562) 547-3255 or fill out the contact form.